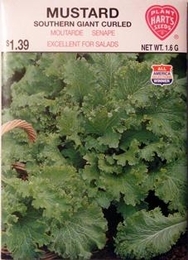 This is the true curled leaf variety of mustard so popular in the South. Leaves are large and wide, bright green with very curled edges. Although somewhat spreading, the plant is quite upright in growth. Enjoy raw, or cooked as greens like spinach. Repeat planting at 2 to 3 week intervals timing last sowing to mature before the heat of mid-summer. Plant Mustard again in late summer for a fall harvest. Cool weather and frost will sweeten the flavor. 18000 Seeds/oz. Plant 1/4oz per 100ft row. 3lbs of Mustard seed needed per acre.